Before registering a trademark in Taiwan you need to perform a Taiwan trademark search. If you are setting up a new company name or getting ready to release a new product in Taiwan, searching the trademark database should be part of your trademark application process. 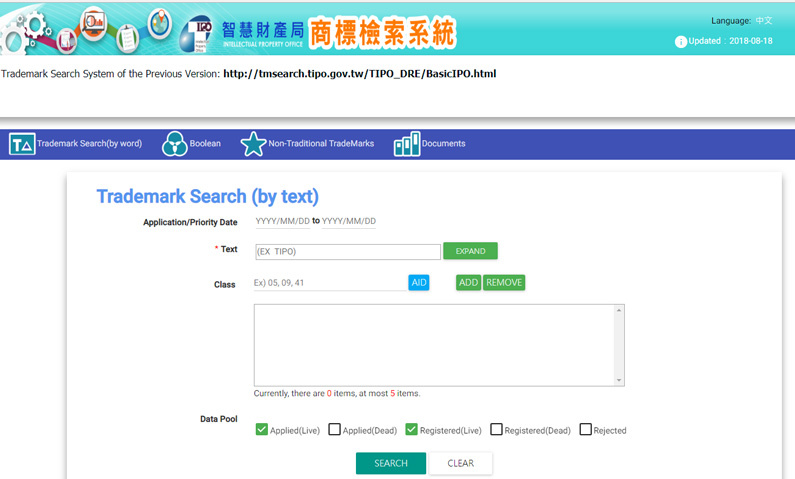 The Taiwan Intellectual Property Office (TIPO) provides both English and Chinese interfaces for searching their database. As you can see the TIPO search allows you to search for words, sounds, 3D shapes, colors, holograms, and motions. Searching for exact matches of a word trademark is straightforward. Just put in the word you would like to protect in the “text” search field. You can also narrow down your search for the trademark classes you would like to register for. If you are a restaurant you might not care if someone has already registered that exact word for the class for industrial machinery since you would never compete for toe to toe. You also have the choice to narrow down the search for Applied(Live), Applied(Dead), Registered(Live), Registered(Dead) and Rejected trademarks. Most of us would be most interested in the Applied (Live) and Registered (Live) categories since those are the ones your mark would be competing with. The Rejected category is also interesting since if someone has applied for something similar to your mark and already been rejected, it tells you that you might want to go back to brainstorming. Where trademark searching gets a bit complicated is when you want to start searching for similar trademarks. TIPO will reject your application if they think it is too similar to another trademark. However, what will be considered too similar might not always be obvious to the inexperienced, that’s why it is important to consult a professional with your trademark application. Here below are four “pairs” of trademarks. In each case, one of these logos were registered as a Taiwan trademark when the other company submitted their registration. 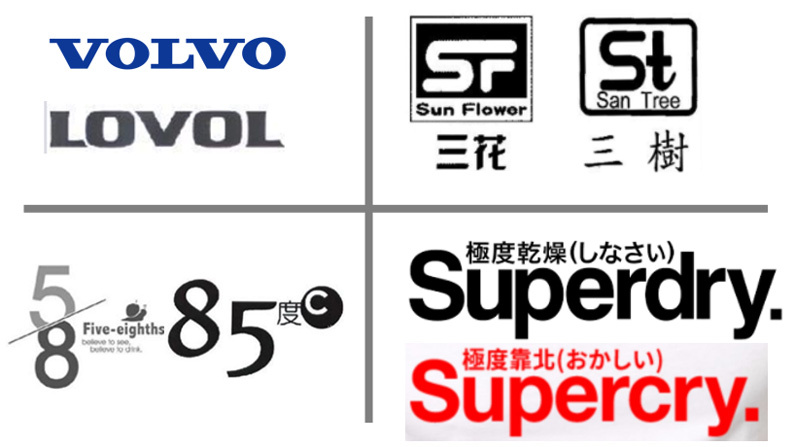 In three of these cases, TIPO judged the new mark to be so similar to the original that the new trademark registration was rejected. Can you tell which was NOT judged to bee to similar? Read on to find which is which. The key principle when searching for similar marks is that the beginning of the word is more significant than the end. This is where the Boolean search form comes handy. You can ask the trademark search tool to return any terms that for example starts with the word “super”. Same thing if your name contains the characters “Canad” and you would like to see marks that contain both “canadA” and “canadadian“. 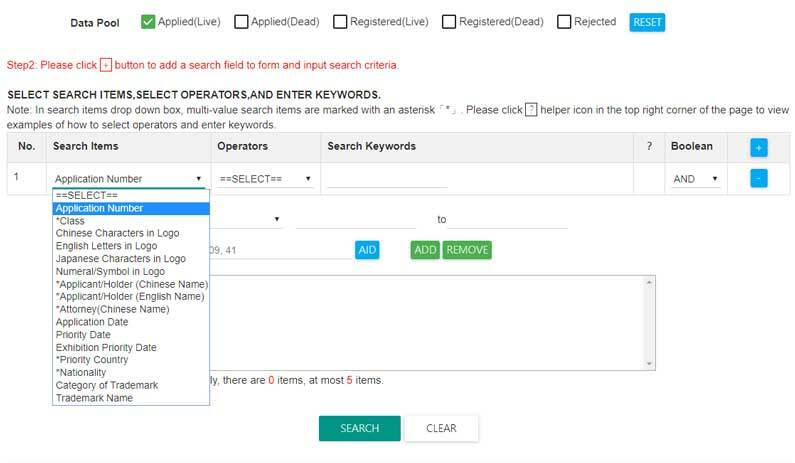 The boolean trademark search interface gives you 16 different data points that you can search. Each can be searched with operators such as head match, tail match, equal to, or less than. By combining more than one of these search items, you can search extremely exact. What to do with similar cases? If you DO find some live trademarks in your trademark classes that you are afraid TIPO might find to be similar to yours, all is not lost. If you can show that customers are not confusing the two due to the nature of your products or usage, they might still be convinced to accept your registration. But doing this is, of course, a risk since it will take many months to get a final decision from the government. Also, any work you are putting in developing your brand (design, advertising, business cards etc) might end up being wasted if you are eventually rejected. If your trademark is already registered in another country and you want to have the same name in all international markets, it might be worth it to fight. If you are just starting out and have the choice to pick another mark, it might be the better choice. MUSA has written an article about the process of picking a name that will likely be accepted. Read it and come back and do another Taiwan Trademark Search. And, MUSA is, of course, happy to help! Performing a trademark search is just one step towards getting your trademark proper legal protection in Taiwan. If you want to learn more we have prepared a Taiwan Trademark Registration How-To guide here. Correct Answer: Sun Flower and San Tree were judged to NOT be similar. The applications for Lovol, 5/8 and Supercry were all rejected because they were too similar to existing marks. They should have done a better job with their Taiwan Trademark Search.